In a microwave safe bowl, mix together eggs and water; cover bowl with paper towel and microwave on HIGH for 3-4 minutes, stirring once after 2 minutes, or until cooked and fluffy. Heat tortillas as directed on package. 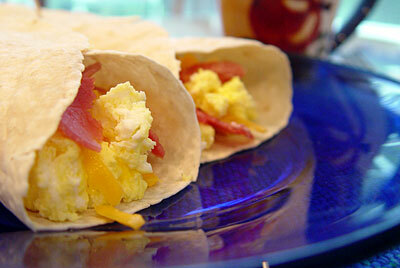 Spoon warm eggs onto tortillas. Top with crumbled bacon and cheese. Roll up to close.